When I picture any museum of art, I go directly to images of The Louvre or the New York Metropolitan Museum of Art. Shame on me! While the museum is part of the picture, it's only a small part. 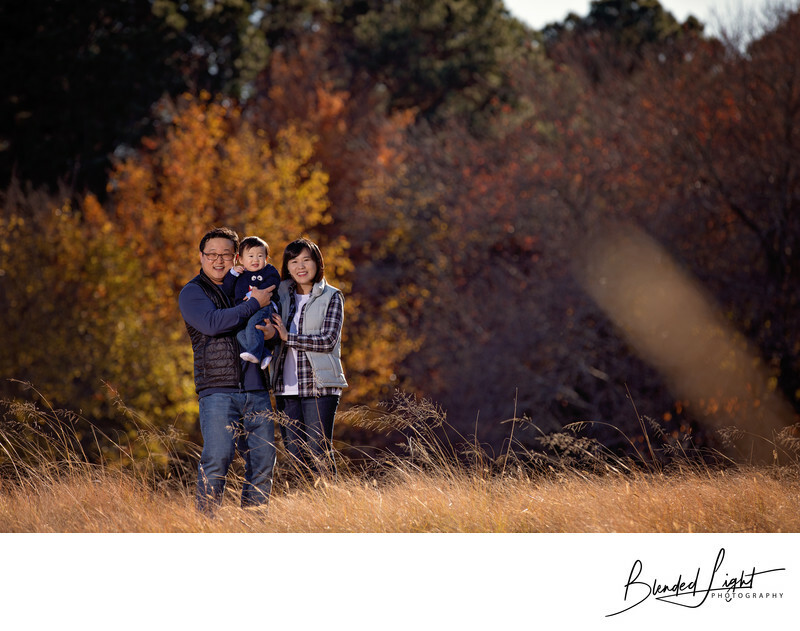 This shot comes from a 1-year old and family session combo. Actually, this is the last image I took during the session. In the hour I spent with the family, I had fallen off the walkway (a drop of about 1.5 feet) out in front of everyone, I had chased a balloon 100 yards across uneven ground and had the wind blow over my flash, destroying my modifier. That's bordering on the photographer embarrassment trifecta! We had done a pretty extensive shoot on the ground with their little one and his balloon. This hill was the backdrop for those images. I had my family walk to the top of the hill, while I took a slightly lower position, allowing me go wider to bring in the fore and backgrounds. With the sun low in the sky behind them and to their left, I positioned my flash, sans modifier, to their right. Despite being bare bulb at this point, the power of the strobe was enough to completely light the families faces against the fall colored tress in the distance. If you are considering the Museum of Art as a location for your family or senior images, I would love to work with you in this beautiful location. If you like what you see here and elsewhere on my site, let's talk and work together! Location: 2110 BLUE RIDGE ROAD, RALEIGH, NC 27607. 1/1000; f/4.0; ISO 100; 182.0 mm.